From time to time I’ll take a detour from chronology to write about specific people. I’ve worked with some exceptionally talented people in my career. For the most part, radio’s morning personalities are a different breed. I have my favorites, like Gary Allen, Wayne Perkey, & JP MCarthy. I wouldn’t say Bruce Grant was my favorite but I do give him credit for teaching me a valuable lesson. I call it “respect the talent”. Bruce was the legendary morning man on WOOD in Grand Rapids. He commanded an audience share of titanic proportions. Most people listened to him every morning. Kids were glued to hear the up to date school closing list in the Winter. For the most part, he was a one man show. “There’s frost on your stacking swivel this morning”. Just one of many Grantisms. With the exception of a news person, Bruce did everything else. Weather, traffic, sports, farm, intermingled with some music which he frequently interrupted. There was always breaking news on The Bruce Grant show before the term “breaking news” was invented. 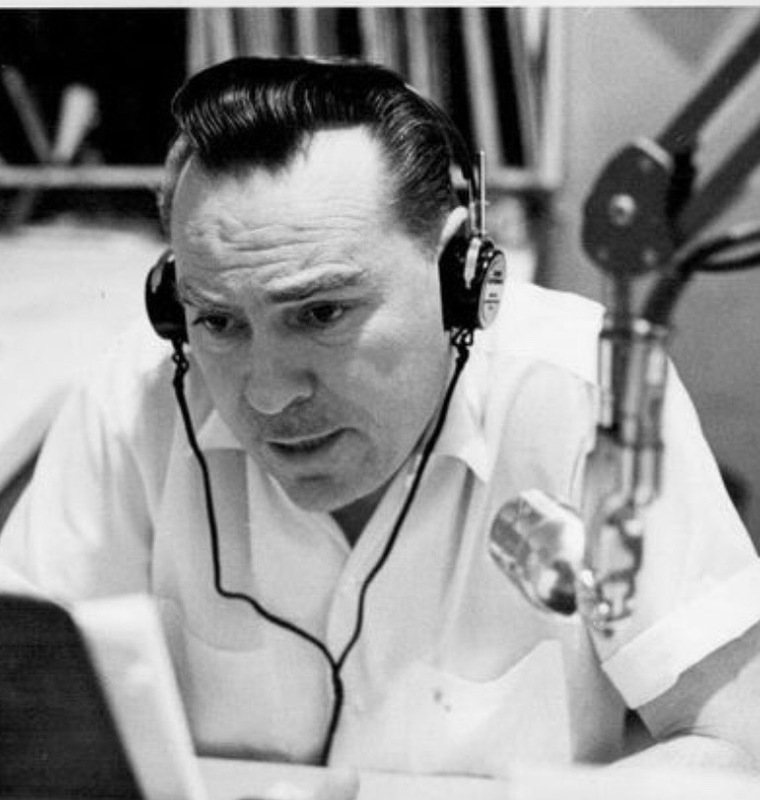 This sense of urgency he created was Bruce’s way of keeping people glued to their radios. Bruce was a WWII marine veteran. He was a tough guy and didn’t take crap from anyone, especially young punk program directors. Bruce would get to the station every morning about 2AM and start putting the show together. Along with all the information, Bruce had a library of audio clips he’d record from various TV shows. These little bits of audio were used as responses to something Bruce was saying. As an example, take the well known clip from Gone With The Wind. Bruce might say something like “Well, the boss here at WOOD Radio says I should play this song” followed by “quite frankly my dear, I don’t give a damn”. Bruce would frequently use this technique to opine on something without, of course, taking the responsibility. Very very clever. And it worked. Bruce’s voices could be the bad guy…Bruce was always always always the good guy. Bruce would frequently play the same commercial twice in a row. He would forget to take the tape cartridge out of the cart machine. Most of our recorded audio was on cartridge. Music, commercials, jingles, etc. As a fail safe, the engineering department made a technical fix to the cart machines. After a cart would play, you had to remove the cart and reinsert it before it would play again. Of course this was a major inconvenience to the rest of the staff who may want to listen to the audio in cue before playing it on the air. I had to fill in one day and wasn’t familiar yet with all the jingles. So I listened to it in cue. Then, following a break, I went to play the jingle and nothing happened…dead air. An engineer ran in, pulled the cart out, reinserted it and hit the play button. Voila! Audio. I asked what the hell happened and was told it was the Bruce Grant fail safe. To which I said “ that’s a load of crap”. I ordered all cart machines be returned to their original status….and that’s what set up an incident that is legendary in the annals of WOOD radio. So, after his show, I went back to the record library where Bruce was filing away his show materials. I was in the hallway..Bruce was in the library. I said “Hey Bruce, you played Homeward Bound twice in a row” to which he repled “well, if you wouldn’t have had the cart machine fail safe removed, that wouldn’t have happened” to which I replied (and here it is) “well, if you were paying attention to what you’re doing, it wouldn’t have hap” but before I finished my words, Grant came flying out of the record library like Leaping Larry Shane (the 60’s wrestling star for those of you who don’t know who Leaping Larry is). He pounced on me and down we go, on the floor in the hallway. The only thing I could do is bury my head as Bruce started throwing punches at my back and shoulders. It took Sales manager Joe Borrello, News Director Greg Moceri, and about 3 or 4 other guys to pull Bruce off me. I stood up and Bruce was in a rage..his face beet red, the veins sticking out of his neck. All I could says is “what the hell is wrong with you”. General Manager Mike Lareau ran out to the hallway and ordered Bruce to his office, and me to my office. A short time later Lareau came into my office, asked if I was OK, and then tells me he sent Bruce home and that he will go out to Bruce’s house later in the afternoon after things have cooled down. “Should I fire him? ” Mike asks. As I mentioned in an earlier post, Lareau always had my back but I knew damn well that there was no way we could fire Bruce. And Mike knew it too. I told Mike that’s the worst thing we could do..revenues would plunge, ratings would plunge, and we’d have a PR nightmare on our hands. “No, just ask Bruce to make an apology to the staff in the lobby tomorrow” And that’s exactly what happened. I was in the right but I sure handled it very wrong. Respect the talent! I learned a very valuable (not to mention painful and embarrassing ) lesson that day. Funny thing, Bruce and I became close after that. I think he knew I wanted him to be #1. And, of course, I did. Skip. I remember this well and you are right! “legendary”. Still talked about occasionally today. I saved your life ya know. And I’ll be eternally grateful! Skip, your recollection of the story is right on – with one exception. It was the tag team of Paul Boscarino and Greg Moceri who pried Bruce off you. A couple of fit young Italians maybe half his age, and it was all Greg and I could do to contain Grant that morning! This is Skip Essick, signing off Blog at WordPress.com.